I based it on THIS card of mine. It's a nice, easy sketch that makes great use of just a few materials. I must say I am loving the K & Co. die cuts that help me create without a lot of time and fuss. Well, thanks so much for your visit today! Have a wonderful day! 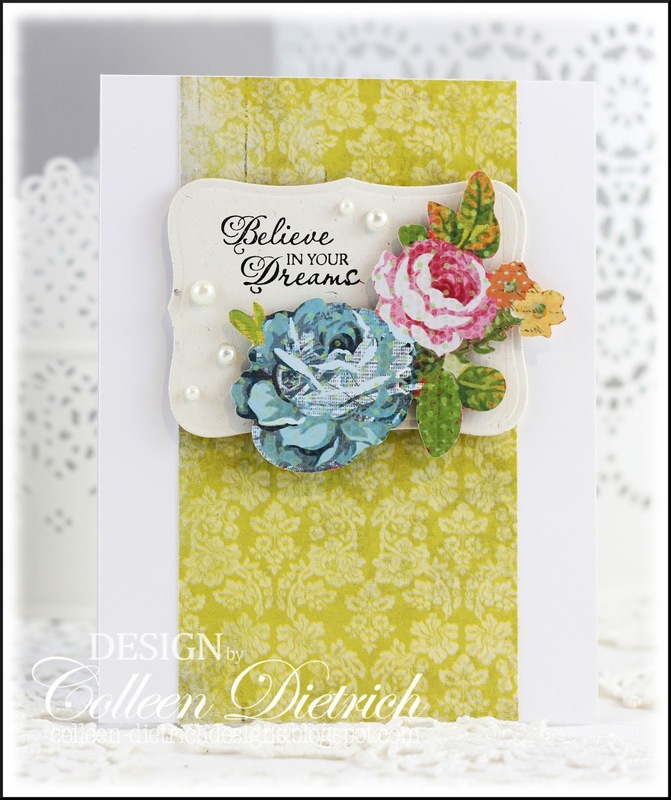 Your card look so beautiful Collen ..you always create magic with the K & co diecuts ..I just love the colors you have used !! Pretty beautiful. I love this. This is gorgeous!! LOVING those flowers and the pearls! Beautiful design! I love your dies too. Also, this post was in my blogger dashboard - yay! Stunning card ! I loved the beautiful colors and the whole layout,just fab ! Oh, so very pretty Colleen! Love the flowers and beautiful elegance of this card! Hope your surgery went very well...hugssss! Very beautiful! Your use of the die-cuts are elegant and perfect! This is ever so pretty, Colleen! Such a deliciously vintage feel with the combination of florals and pearls! This is beautiful, and so nice when it doesn't take a lot of time to create this much (soft) impact, especially when you're making cards to sell. You can always count on K&CO to have beautiful embellies. Your card turned out to be so beautiful and the sentiment is perfect for a grad. Thanks for coming by my blog. I've started back today trying to stamp, upload, and vist blogs. LOVE those roses, Colleen! What a Special graduation card! Just beautiful. I love the vintage feel to this with the image and the colors. Great job on this sweet card. Aaah! Love these soft flowers! A beautiful card!